Easter, the day we celebrate the resurrection of our Lord Jesus Christ from the grave. Jesus died for our sins and conquered death making it possible for you and me to have a restored relationship with Him. It’s a love story we love to tell because it is the Good News! God is bringing the unreached peoples of the world within arm’s reach of Christians and churches throughout North America. Through sharing the website ScriptureEarth.org we can engage the unreached peoples with this Good News in their language. For I delivered to you first of all that which I also received: that Christ died for our sins according to the Scriptures,(Is.5:3, John 1:29) and that He was buried, and that He rose again the third day according to the Scriptures(Ps. 16:10, Luke 24:26-27). 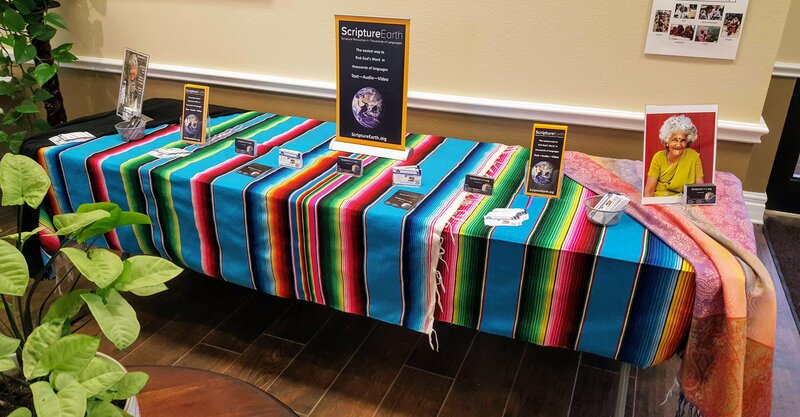 Praise: We are having great opportunities promoting ScriptureEarth.org to the staff at the Wycliffe US offices in Orlando. Many are catching the vision and sharing it with others. Praise: Our friend Mike loaned us their RV to use through May. It’s conveniently located near WBT. Prayer that the WBT US leadership will catch the vision for the significance of the site and will place it in a prominent place on the WBT website and in their literature. Prayer for Direction in producing some audio and video promotional/vision casting materials. Prayer that Judy and I get some professional training in “live radio interviews”. Prayer for More funding to come in for Scripture Earth Promotion fund This provides for the promotional costs. 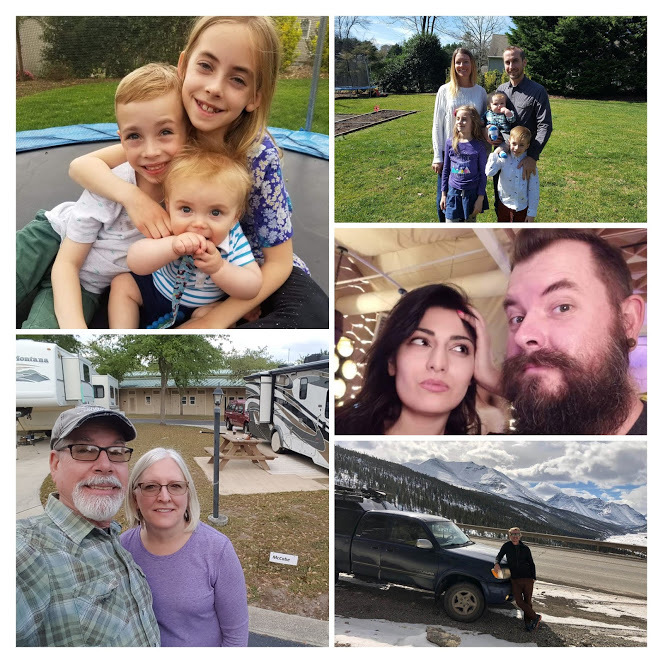 Prayer for our children and grandkids spread around the world: China-Josh, Russia-Ani-(Josh’s wife), Alaska-Jordan and North Carolina-Jody & family. *, see picture collage below. Praise that my Dad-99 and Judy’s parents -mid-’80s are doing well for their ages. They found the Bible in their language! A Dallas Baptist University professor heard about ScriptureEarth.org and shared it with one of her students. Her student is a native Grebo speaker from Liberia. He had never read Scripture in his own language. Now he has it in text and audio and can watch the Jesus film. The man behind the counter had an African accent. I commented that I had worked in Africa and asked what country he was from. He said Zambia. I showed him the ScriptureEarth.org website on my phone and I entered Zambia under the country. When the languages came up, I asked which of the 35 languages he spoke. With a big smile, he showed me his language. I clicked it and showed him all the Bible and other resources available. I handed him the SE card. He was very appreciative. Because it is “His” language, he will pass it on to family and friends. Thank you for your faithful prayers and for joining us in this work. God & you are making this possible. What it is? ScriptureEarth.org is the easiest and most complete website for accessing the Bible and Scripture resources in thousands of languages. Through text, audio, and video, Scripture Earth provides access to Scripture resources from the best Bible translation and Scripture distribution organizations, such as YouVersion, Wycliffe, CRU, Faith Comes by Hearing/Hosanna, SIL and many more. We collaborate to provide Bible access to all the languages of the world from a single internet website. Why it is important? Many people have moved from their home countries, some freely and others by force, requiring a change to a new language. For them, their first language is a significant part of their identity. It is the language that speaks to their heart’s deepest questions about life and God. 20% of the U.S. residents speak a language other than English at home; about 65 million people. ScriptureEarth.org can be a bridge to restoration, hope, and access to God’s Word in a language and form they clearly understand. How to use it? Giving access to God’s Word will happen as each of us promote ScriptureEarth.org to our churches and contacts. You and I can bookmark it on our smartphones, place the website on our email, Facebook, blog posts, Twitter, and our personal and organizational publications. Please like the pages you open on Scripture Earth and share with others. I think God made the internet to provide Scripture Access to the world. The Goal is to inform North America about this resource. Promotion to 400,000 churches, and Christian schools, Universities, Native American Communities, Refugee ministries, and Christian media. Together we can provide Scripture access to the world! In Your community: Start a conversation. An example: The man behind the counter had an African accent. I commented that I had worked in Africa and asked what country he was from. He said Zambia. I showed him the ScriptureEarth.org website on my phone and I entered Zambia under country. When the languages came up I asked which of the 35 languages he spoke. With a big smile, he showed me his language. I clicked it and showed him all the Bible and other resources available. I handed him the SE card. He was very appreciative and said he would look at it later. Because it is “His” language, he will pass it on to family and friends back home. Ask God how He wants you to help connect people to His Word in their language. God is creative and He will show you new and better ways. Give Scripture Earth cards to people who grew up speaking a language other than English. I can ship you some cards or you can make up your own. Once you have it bookmarked on your phone you can easily show others the site. We are excited to introduce the new look to the front page of the ScriptureEarth.org web page. (See above) Our developing team worked very hard for several months to come up with this look. We just received March statistics for Scripture Earth.org (SE) and it is astounding! These figures are doubled from 2017. Promoting is working! People are finding Gods Word in their language! Thanks so much for praying for this to happen! In our last letter, we told about our trip to Baton Rouge to help some long-time friends. Judy decluttered, cleaned, and watched HGTV with the wife, while Jim put up blinds in their kitchen, to help her feel safer, worked on the car and other honey-dos that her husband can’t do. (Remember he has Neural Invasive West Nile Virus and has been in the hospital since Aug.) His rehabilitation is a long, possibly, 2-year process. He is improving and for that we thank God. Please pray for Arval and for his wife Penny with increasing memory challenges. After Baton Rouge, we headed to NC. Jim needed to get his annual recurrent training on the JAARS 4X4 training material. See the picture below. We also got to see our grandkids in Hickory for a week. While in Hickory, Jim visited 35 churches. Most of the pastoral staff were not at the church buildings. (They were out doing ministry!) Pray with us for a better strategy to speak to church leaders and for follow-up. On our way back to Dallas, Texas we stopped by the Choctaw Nation Bible translation project in Mississippi. We met Chris and Millie, the Choctaw speakers and Laura, the Wycliffe colleague working with them. We showed them the Scripture Earth website and their Choctaw material on it. Jim taught them how to get more of their Scripture projects on it, and helped them bookmark it to their smartphones. Pray for the finishing of the checking of their NT; they are getting close and the enemy is ramping up attacks. We will work in Dallas until March 15th and then make our way to Florida. Our friend Mike is loaning us his RV. It is waiting for us at the RV park across the street from the Wycliffe USA headquarters. There are just enough donations in the Scripture Earth Promotion Project to use the RV if we keep it in one place. Our plan is to work in Orlando from mid-March to mid-May. We will promote ScriptureEarth.org to the staff working at the Wycliffe office as well as churches and organizations working with refugees. Pray for travel mercies and good connections! Pray for our friend Mike; he is fighting prostate cancer. Every week we see why God led us to Texas. Not only have we talked to 500+ people and distribute 750+ Scripture Earth communication cards, but we got to attend several mission conferences. We had a display table at both the Evangelical Missiological Society and Global Languages Services Conferences. We came away with better insight into the migrant population issues, and how different organizations are trying to address it. People are starting to understand how important Scripture Earth is to organizations needing to provide the Bible in a language and form people understand best. Each significant conversation with someone about the website and its resources help to spread this tool. It’s so cool when someone “gets it” and becomes excited to share it stateside and around the world. One conference speaker, with an amazing story, told of being carried along on a God-ordained wave as a refugee group came into their lives. Long story, but through this encounter, a church was born in Winston-Salem and new missionaries from among the refugees are now returning to their home country to evangelize and encourage the believers. They are using Scripture Earth! Yeah! God is waking-up the Church. Pray for those reaching out to refugees. Pray that the Church will be His hands and feet. Thank you for your vital part in this ministry to give God’s word to people in Dallas, TX, the USA, and beyond! We could not do this without you. Click to partner with Scripture Earth Promotion Project online! God has opened many doors for us to share the Scripture Earth website in Dallas since we arrived on January 8. It’s been remarkable! We have spoken with a couple hundred people and have given out 500 info cards. It has been exciting to see the enthusiasm as people grasp the enormity of what can happen when this website is shared. Part of our focus has been to promote it to Wycliffe/SIL and other partner organizations working on the International Linguistic Center in Duncanville, TX. We encourage them to share it with others. Joy spread on the face of a nurse when a colleague shared it with her. Judy shared it with a Navaho lady who shared it with her grandparents who still speak the language. Jim shared it with a husband and wife from Nepal and they were intrigued. We have also visited several churches and refugee ministries. Wish you could see their eyes light up as they access the scripture resources available on their phones in their mother tongue language. You probably remember that we are asking God for an RV to criss-cross the US promoting the website. Recently a friend, Mike, called to offer us the short term use (as in months not years) of his 30 ft C-class RV. We are so thankful for his offer, but after praying about his offer, we were reminded that the Scripture Earth Promotion Project has not been funded yet, something that is accomplished through individuals, churches, or businesses. This project will cover the costs of promotional materials, transportation expenses, and advertising. Wycliffe doesn’t want us using our personal ministry budget to cover these expenses. The 2019 budget is $11,800. Will you pray with us? Together we will watch God provide for this! Something you can do is start a group funding site on the internet. Wycliffe offers a really easy way to do this. Find it here. There are other good sites as well like, FaceBook Fundraiser, Go Fund Me, and crowdfunding. URGENT PRAYER for our friend Mike. He has prostate cancer. It was in remission but has returned. It has spread significantly and he is entering an experimental program. Pray also for the Scripture Earth developers and programmers. They are in the process of moving the site to another server location. It outgrew the old location. As a result, the site also lost its funding. 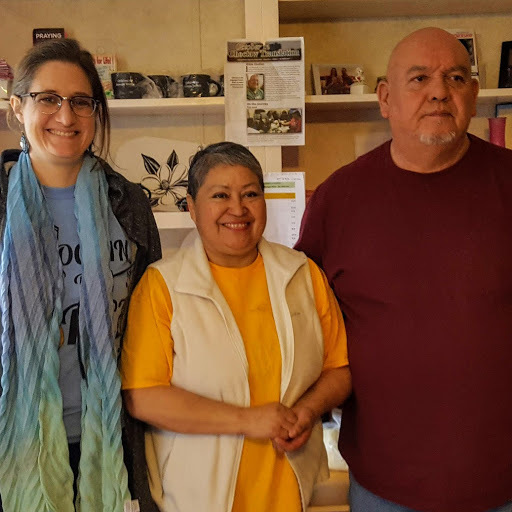 But praise God, last week some Wycliffe volunteers in Tucson committed to funding it for 2019. Pray for wisdom as we research and plan the next 12 months. We want to be at the locations and events where the scripture earth resource can have the greatest impact. *If you know of an event, ministry, organization or church that needs to know about this website please let us know. Praise we are getting some promotional materials created. It’s very time-consuming for us non-media folks, but we are thankful for a colleague who is helping them look great! Personal Prayer we are in Baton Rouge for a week (Feb 9 – 16) to help our friend Arval recovering from neuro-invasive West Nile Virus and his wife who has memory issues. Her sister will be away for two weeks ministering at a retreat for missionaries in Asia. Just Saturday a specialist from Mississippi came to do a nerve conduction test which showed his nerves are good so that PT should increase. Pray the insurance will approve this treatment and that he can improve his breathing. Our first challenge is getting our Wycliffe ScriptureEarth.org promotion materials designed and printed. Then our primary focus will be helping pastors and churches understand what ScriptureEarth.org is and how to use it in their church. We will be working with refugee aid groups, both Christian and secular introducing them to ScriptureEarth.org and how to use Scripture in a refugees language to bring calm in stressful transitions. We’ll be introducing Christian schools, primary, high school and college to ScriptureEarth.org and how to use it. We hope there will be time to build ads for Christian media; print, internet, radio and TV. Pray it can happen. Keep praying for God’s provision of an RV for us to use. The US census bureau tells us that 20% of the people living in the US do not speak English at home. They grew up speaking a language other than English. They may only have a 40% – 60% comprehension of English. That isn’t enough to understand the Bible in English. That other language is what they pray in. They need to be reading the Bible in that other language. 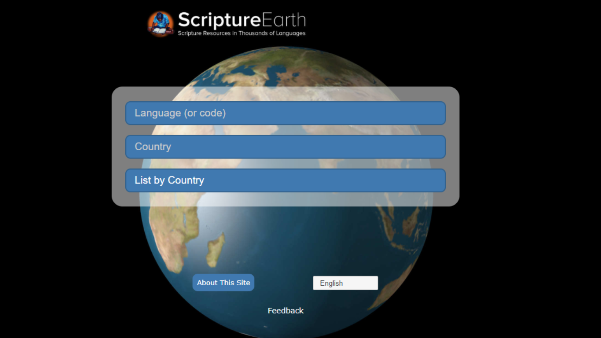 ScriptureEarth.org is the easiest way to find Scripture in thousands of languages. The church is an excellent place for refugees to learn English and American traditions. The church can place the ScriptureEarth.org web site on their Sunday morning info slides, in the church bulletin, on the church web page and make a simple ten second announcement at the beginning of each service. Something like, ” If you did not grow up speaking English, go to this website and hopefully find the Bible in your language. Then you can follow along in your language on your smartphone.” This can be an excellent Christian outreach to the percentage of church attendees who know some English don’t speak English at home. Thanks for your prayer partnership, none of this could be happening without your involvement. Jim and Judy McCabe with Wycliffe ScriptureEarth.org promotion. Christmas 2018 is over. We hope that yours was blessed with joyful times of celebration. We had a wonderful time with two of our three children and our 3 grandkids. The countdown to the New Year is on! As it draws to a close will you consider making a donation to the Wycliffe Scripture Earth Promotion project fund? Through this project you will have a part in giving the gift of the Scriptures in a form and language best understood by those refugees in our midst. Like to a Malaysian women who recently was introduced to the ScriptureEarth.org website. Her eyes went wide with amazement as she found many resources available on her smartphone. She was excited to return home to show her aunt what she had found. Then there’s the Filipino woman living in Illinois who also had a similar reaction as she was blown away by all of the resources available. She said she would be forwarding this to her mother and family who were still in the Philippines. Thanks for sharing the website with people you meet and sharing your stories with us. Jim returned to the US, Dec. 17th, from the 4×4 training course in PNG. It went really well and was appreciated by the participants. (He said he will write an email…soon.) I joined him in North Carolina on the 18th. The Friday before I flew out to meet him in NC, my SI joint went out. I could barely walk and surely couldn’t get the house cleaned for the snowbirds who will be staying in it, January and February. Thank you to those from our church who helped get it clean. Please pray for healing as it is still bothering me. Right now we are in Wichita seeing Jim’s Dad, who was in the hospital over Christmas. He’s doing great now. We will head down to Dallas the end of the week where we will be promoting the SE website to churches and ministries until March. God provided a place for us to stay and we are excited to begin our Scripture Earth website promotion work there.